Revelation 11:15-19 ends a distinct series of eschatological prophecies that began in 8:2. In that finale, the seventh trumpet sounded, Christ received His kingdom (11:15; cf. Daniel 7:14, Revelation 10:7), and a choir of 24 redeemed elders gave a beautiful victory anthem, revealing that redemptive history had closed. The open temple, exposing the Most Holy, was devoid of activity, signifying that all mediatorial work had ceased. Revelation 19:1-8 repeats the same theophany as noted in 11:19, dramatically announcing that God’s reclamation work has ended. Both represent the same time period. The impress of that last period in earth’s functional state is riveted in many ways in the apocalypse. 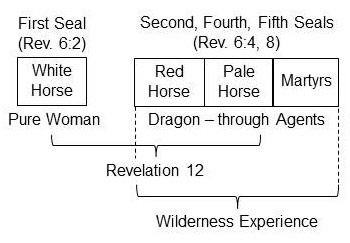 Focused areas within the seven seals unfold events in the pure woman’s journey as she battles Satan’s agencies, represented by the seven crowned heads and ten horns. With each new prophetic “missive,” information is expanded. New details elevate the intensity of the final period of redemptive history. All mushroom into an amazing saga that anticipates our immediate future. Even the churches and seven trumpets contribute very distinct messages, oriented to the culmination of the saving hope for God’s last generation. As we move into Revelation 12, this “block” of communiques is filled with special symbols, themes and clocks, detailing parts of the last war between Christ’s followers and Satan’s – the saints and the wicked! This chapter has two sections; structurally, it creates an amazing introduction to the rest of the book. Overview of God’s last-day church (woman) and of Satan (dragon) working with his minions to harm her (12:1-11). Prophecy of that conflict that is a preamble to Revelation 13–19 (12:12-17). The imagery of the key “individuals,” that woman and dragon, are observed in the sky. The dragon is evil and out to kill the pregnant-and-in-labor woman’s offspring. The storyline comes in segments, back and forth between the dragon and his “host” and the woman and her “host.” Snippets vary as to their location: heaven, earth or sky. Many view the two time periods addressed for these “players” (1260 days, time times half a time) as separate periods – others as one event with progressive, riveting information. The latter is adopted in this narrative. Beale even persuasively suggests that Revelation 12 is one vision. The chapter portrays the deepest Biblical dimensions of the conflict between good and evil – Christ and Satan. That was introduced in the seven churches and echoes the Danelic “time of the end” prophecies beginning with the Ram and he-goat in Daniel 8. Something is uniquely special in this narrative – it introduces how we should think, as the remainder of the book is studied! The time period suggests a link to Daniel 7:25, 12:7 and Revelation 12:2-3. We had a distinct “end” portrayed in 11:19, with the temple in heaven as “empty.” That was the terminus ad quem of its story – redemptive history had closed. Now, another way to describe a segment of that divine reclamation work comes through Revelation 12:1–16:21. The structure of the first part of this chapter is complex. The messages are functionally oriented by the locations of their occurrences. The importance of all this unfolds as the study progresses. John does not describe the details of how this woman “appeared” to him. Perhaps while gazing heavenward, this “picture” suddenly loomed. It is called a “sign” or “wonder” (semeion – G), signaling that some prophetic point had occurred. It is a distinct break from that heavenly sanctuary picture (11:19). That was also an exclusive mark in end time. This “great” manifestation is contrasted elsewhere with the “great” dragon (12:3, 9), the “great” city (11:8, 16:19, 18:16-17), “great” Babylon (14:8, 16:19, 17:5, 18:2-3) and the “great” harlot (17:1, 19:2). Shortly, John will call the dragon in the same sky another sign (12:3). “Heaven” could suggest the center of the universe since it is used later to tell where Satan was expelled from. However, most expositors contend that it is where John views these visionary wonders. A special “prophetic apocalyptic era” is about to be introduced that terminates with a pure woman. The first Biblical allusion to a “woman” being a community of God’s people came in Genesis 3:15. That was a prophecy anticipating this conflict between Satan and the woman (God’s people). God later depicted a woman–bride as Zion (Isaiah 61:10; 62:3, 5) with a crown of beauty – “restored Israel” (Isaiah 60:19-20). She had been a barren woman, but then gave birth (Isaiah 54:1). Paul reminded the Corinthian church that God espoused them as a bride to Christ (II Corinthians 11:2; cf. Hosea 2:19; Jeremiah 4:31; Micah 4:10, 5:3; II John 1). Thus, this “woman” imagery is a “great sign” for God, because she belongs to Him. This pure woman will later be described as His “wife,” who “hath made herself ready” (Revelation 19:7b) for marriage to the Lamb (cf. Isaiah 54:5, Galatians 4:26). This stellar brightness echoes the beauty of Christ’s glory (1:16, 10:1, 21:23, 22:5). It reveals this woman’s heavenly association. linen, clean and white: for the fine linen is the righteousness of saints” (Revelation 19:8; cf. Jeremiah 2:2). “I will greatly rejoice in the LORD, my soul shall be joyful in my God; for he hath clothed me with the garments of salvation, he hath covered me with the robe of righteousness, as a bridegroom decketh himself with ornaments, and as a bride adorneth herself with her jewels” (Isaiah 61:10). This woman is arrayed with the sunlight of Christ’s holiness. His righteousness, described elsewhere, is a beautiful, white raiment. This mirrors the garment of light He has clothed Himself with (Psalm 104:2). Her face does not shine like the Son’s. That is reserved for the “Son of man” (Revelation 1:16; cf. Matthew 17:2). The Greek word for “moon” is selene. It is used mainly in the New Testament in an eschatological context (cf. Luke 21:25, Revelation 21:23, I Corinthians 15:41). It is earth’s only natural satellite and “guardian” of the night. In ancient times its Hebrew equivalent, ya•re•ach, suggested, idiomatically, “something that wanders” (because it moved across the heavens at night). The crown here described is stephanos (G), which is one of victory. This is seen at the end when God’s “church” defeats the devious chicanery of Satan! This illustrates when the purified church is sealed (2:10; 3:11; 4:4, 10; 14:14). This crown reveals that a group, claiming to be Christ’s, has risen above all opposition to their faith. “You will be a crown of splendor in the Lord’s hand, … in the hand of your God” (Isaiah 62:3 – NIV). She is an overcomer. How? Shortly, John makes it wonderfully clear: “by the blood of the Lamb” (Revelation 12:11). That conflict (battle) was projected in the Garden of Eden. Satan would bruise its heel and, in the end, hatred against sin would strike a fatal blow to Satan through the woman! The “twelve stars” represent the twelve tribes of spiritual Israel that make up God’s last-day church (the 144,000 – Revelation 7:4-8; cf. Galatians 3:26-29; Ephesians 3:4-9; Romans 1:28-29, 10:12). “And I heard the number of them which were sealed: and there were sealed an hundred and forty and four thousand of all the tribes of the children of Israel” (Revelation 7:4). This body of believers are sealed for eternity. Stars, in prophecy, represent leaders of God’s people. In the Old Testament the little horn magnified himself to the “host of heaven” and cast down some of the host and stars to the ground (Daniel 8:10). These celestial “objects” are later defined as “the mighty and the holy people” (8:24). Earlier in Revelation, Jesus told John that the “stars” (“the mystery of the seven stars”) in His right hand were “the angels of the seven churches” (Revelation 1:20). This referred to their leaders (a message that precedes each narrative of those the seven churches). The 144,000, made up of those twelve tribes, are God’s last-day “leaders” who finish the gospel work. All the collective symbols of this woman suggest that she is that unique body of believers. She has gained a victory over the world. She is clothed with the righteousness of Christ. She has already been given a crown of victory. That crown is made up of twelve “stars” or leaders of the twelve groups of God’s people. She is the sealed “church” of Revelation 7, depicted again in Revelation 14:1-5. The great “sign” ends with verse 1. Now anchor points from her history storyline begin. What follows are little bits, snippets, of prophecy that tell how this woman came to be the “pure church” – the final group ready for heaven! The formal prophecy regarding her begins in verse 12. “And she being with child cried, travailing in birth, and pained to be delivered” (Revelation 12:2). Many Protestant scholars, as well as in the Roman Catholic Church tradition, have concluded that this is Christ’s mother, Mary, who is ready to give birth to Jesus. There is, however, no Biblical basis to affirm that she was such a morally perfect mother. Furthermore – there is no inspired Scripture to show that Mary had dominion over the earth or its “darkness.” Only tradition can assert this claim. “It” was birthed through pain (persecution), described shortly. This is the experience of the last-day “people of God.” The 144,000 – the white horse seal – gives “birth” to this harvest through its “conquering” activity! Isaiah 66:7 (LXX) uses the metaphor of Israel bearing a male child, indicating the arrival of a period when salvation is corporately coming to earth’s loyalists. Thus, “travail” of a literal woman’s labor is a metaphor in the New Testament. “For nation shall rise against nation, and kingdom against kingdom: and there shall be famines, and pestilences, and earthquakes, in divers places. All these are the beginning of sorrows” – birth pangs (Matthew 24:7-8). In John 16:19-22 Christ compares the anticipated grief of his disciples over his impending death to “a woman about to give birth who has sorrow.” But then He notes the joy comes after the birth of the child, alluding to His resurrection. There, the disciples represent the mother of the Messianic community. This connection in both John 16:22 and Revelation 12:2 echo the prophecies in Isaiah, where Israel is like a woman in labor bringing forth deliverance from a time of persecution (Isaiah 26:16-18, 66:7-9). These are literal and spiritual Hebrew symbols, explaining and moving forward God’s redemptive plan for a chosen people that would encompass the world. But – there is something different here in Revelation 12! John’s descriptive imagery of “travailing” is unique. The word for “travail” or pain is from the verb basanizo, reflecting a form of torment. The New Testament uses this word for suffering under persecution or trial (Matthew 8:6, 29; 14:24; Mark 5:7, 6:48; II Peter 2:8). This is directed against the nation of believers. Intriguingly, this word and its cognates are used even in extrabiblical literature only for distress of God’s people under persecution (e.g., 2 Mac. 7:13). In Revelation it is used for suffering inflicted by satanic powers (9:5) or by God’s judgments (11:10, 14:10, 20:10). Basanizo is used nowhere else in the Biblical narrative as referring to a woman suffering birth pains – except here in 12:2! This suggests that deliverance from persecution is intimately related to the time of the end (Daniel 12:1). Collectively, her cry, travail and pain depict this end-time church as suffering severe trials and persecution, called “birth pangs.” But this travail will result in a birth (a deliverance). She delivers a man child under great difficulty, a “new creation,” which the clutches of Satan cannot touch. Eve, it was prophesied, would bear in pain the future seed who would smite the head of Satan. This echoes the woman Zion (Isaiah 51:2-3, 9-11). This prophecy is when the head of Satan receives its mortal wound – when it is no longer an agent of harm to God’s people, when they are delivered! The present tense of “cries and anguish” indicates prolonged suffering. Contextually, the woman is crying out to God for relief from the persecution she is experiencing as she is finishing her work on earth! Christ’s use of the pains of childbirth in Mark 13:8 is eschatological. But, again, that is a different word (odin – G). What suffering? The second sign of the dragon, which will begin shortly in this discourse. We will now look at only a small issue in that narrative to deal with the woman’s child. The 144,000 (the pure woman) are persecuted (pained) as the birth process proceeds. “And there went out another horse that was red: and power was given to him that sat thereon to take peace from the earth” (Revelation 6:4a). “And the serpent cast out of his mouth water as a flood after the woman, that he might cause her to be carried away of the flood” (Revelation 12:15). “And it was given unto him to make war with the saints, and to overcome them” (Revelation 13:7a). “These shall make war with the Lamb” (14a). Satan’s evil plans are toward the unborn child (the byproduct of the 144,000) who are sealed – pure. Their work of witnessing is successful (Revelation 11:7a). Satan must deceive, kill or block that “group of believers” from becoming a multitude for heaven (Revelation 7:14). “The dragon’s evil intentions toward the woman’s unborn child evidenced themselves throughout OT history. Instances of his hostility surfaced in Cain’s murder of Abel (Gen. 4:8), the corrupting of the line of Seth (Gen. 6:1-12), attempted rapes of Sarah (Gen. 12:10-20; 20:1-18) and Rebekah (Gen. 26:1-18), Rebekah’s plan to cheat Esau out of his birthright and the consequent enmity of Esau against Jacob (Gen. 27), the murder of the male children in Egypt (Ex. 1:15-22), attempted murders of David (e.g., 1 Sam. 18:10-11), Queen Athaliah’s attempt to destroy the royal seed (2 Chron. 22:10), Haman’s attempt to slaughter the Jews (Esther 3-9), and consistent attempts of the Israelites to murder their own children for sacrificial purposes (cf. Lev. 18:21; 2 Kings 16:3; 2 Chron. 28:3; Ps. 106:37-38; Ezek. 16:20). This apocalyptic child is now the focus of warfare against God. The final expansion of God’s kingdom is clearly anticipated by Satan. A lethal blow must come against those with a new birth experience (contextually implied). The dragon “standing” represents the utter hatred of Satan against the woman–church, again prophesied in Genesis 3:15. This is broadened later when it is announced that the devil knows his time is short (12:12). Another timing “snippet” or “segment” of this woman’s journey to become the “holy people of God” unfolds in verse 6. Many of these introductory issues will be revisited through a sequenced prophecy later in this chapter, which begins in verse 12. This is another scene in the journey that God’s people take in their pilgrimage to become the “victorious woman” – a bride that “made herself ready” (Revelation 19:7)! A “death plot” to destroy the woman’s child (the remnant) is symbolized by Satan’s standing ready to destroy “him.” As it will be seen, “his” deliverance leaves Satan helpless. They will arrive safely in heaven. Beale, Gregory K.; The New International Greek Testament Commentary; The Book of Revelation (William B. Eerdmans Publishing Company, Grand Rapids, Michigan – 1999), p. 622. Thomas, Robert L.; Revelation 8–22 – An Exegetical Commentary (Moody Press, Chicago), 1995, p. 119. Beale, Gregory K.; The New International Greek Testament Commentary; The Book of Revelation (William B. Eerdmans Publishing Company, Grand Rapids, Michigan – 1999), p. 625. Beale, op. cit., pp. 628-632. Stefanovic, Ranko; Revelation of Jesus Christ (Andrews University Press, Berrien Springs, MI; 2002), p. 378, quoting J. Massyngberde Ford, Revelation (The Anchor Bible Doubleday, New York), p. 195. LaRondelle, Hans, Th.D. ; How to Understand the End-Time Prophecies of the Bible (First Impressions; Sarasota, FL 34243 – 1997), p. 274. Osborne, Grant R.; Revelation (Baker Book House; Grand Rapids, MI), p. 456. Beale, G. K.; The New International Greek Testament Commentary; The Book of Revelation (William B.
Eerdmans Publishing Company, Grand Rapids, Michigan – 1999), p. 631. White, Ellen G.; The Review and Herald, February 26, 1914. Mounce, Robert H.; The Book of Revelation (Wm. B. Eerdmans Publishing Co., Grand Rapids, Michigan, 1977), p. 231. White, Ellen G.; The Signs of the Times, November 1, 1899. White, Ellen G.; Child Guidance, p. 568. White, Ellen G.; A Call to Medical Evangelism and Health Education, p. 26. Brighton, Louis A; Revelation, Concordance Commentary (Concordance Publishing House, Saint Louis), 1999, p.326. Osborne, op. cit., pp. 456-457. Mare, W. H.; Pictoral Encyclopedia of the Bible, vol. 4, p. 273. Beale, op. cit., p. 627. White, Ellen G.; Christ’s Object Lessons, p. 406. Osborne, Grant R.; Revelation (Baker Book House; Grand Rapids, MI), p. 457. Aune, David E.; 52B World Biblical Commentary; Revelation 6–16 (World Books; Dallas, Texas), 1997, p. 602. Thomas, Robert L.; Revelation 8–22 – An Exegetical Commentary (Moody Press, Chicago), 1995, p. 121. Beale, Gregory K.; The New International Greek Testament Commentary; The Book of Revelation (William B. Eerdmans Publishing Company, Grand Rapids, Michigan – 1999), p. 630. Johnson, Alan F.; Revelation, p. 514, from Gaebelein, Frank E. (gen. ed. ); The Expositor’s Bible Commentary, vol. II (Zondervan, Grand Rapids, MI 49530; 1981). Beale, op. cit., p. 629. Aune, op. cit., p. 688. Ford, J. Massyngberde; Revelation (The Anchor Bible Doubleday, New York), pp. 197-198. Thomas, Robert L.; Revelation 8–22 – An Exegetical Commentary (Moody Press, Chicago; 1995), vol. 2, p. 125. Brighton, Louis A; Revelation, Concordance Commentary (Concordance Publishing House, Saint Louis), 1999, p. 330-331. Osborne, op. cit., p. 464.